After launching its ‘Subscribe and Save’ service in India, Amazon became the buzziest brand in the country and I don’t think the online marketplace giant has to prove its mettle anymore in India. According to Maktech, a tech blog, Amazon is planning to bring its supreme ‘Prime’ services in India, just after completion of 3 years of operations in the country. Amazon’s Prime service has been very well received in the United States, the United Kingdom, Japan and some west European countries. Maktech’s sources say that Amazon Prime will be launched at Amazon India’s 3rd anniversary next month and the same was verified from a source code on the website. 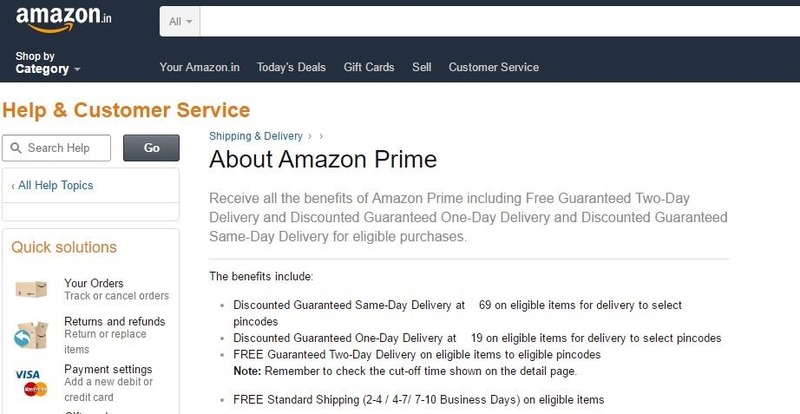 There were several mentions of the service and some statements about a guaranteed two-day delivery, which is one of the leading features of Amazon Prime. Maktech also says that the url for the website would be amazon.in/gp/prime, which does not seem to have been activated yet. 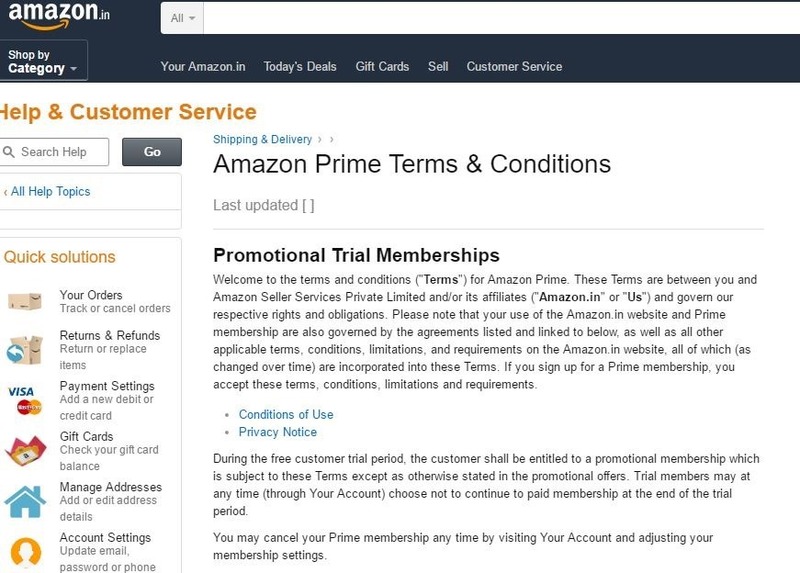 We tried to find more references on the Amazon India site regarding Amazon Prime, and sure enough we hit upon their “Amazon Prime Terms & Conditions Page”, which point to the fact that Prime is definitely coming to India. You can see from the page is still in process of being updated and some sentences (first 2 bullet points) are not grammatically correct. We did not come across any more details like pricing, date of launch etc. But these pages being available on Amazon point to fact that Amazon Prime is definitely coming to India. Firstly, Amazon Prime offers guaranteed free two-day delivery, along with unlimited deliveries with no minimum order size. The offers are on a huge list of products, so you don’t have to worry about missing on your favourite item. Some limited products also come with free same day delivery, which means you don’t pay extra to get the order on the same day, sweet! This offer is also usually available in metros only right now, since transportation is relatively easier in large cities. Amazon in the US and the UK has online movie and TV shows streaming service and ‘Prime Instant Video’ gives you the benefit of watching them anywhere and anytime with no restrictions. The whole collection can be viewed offline on Amazon’s app as well. Amazon Prime also offers unlimited song streaming and access to millions of albums, unlimited photo storage, close to a million free ebooks for kindle and a 30-minute early access to lightning deals on the website. All of this for just under $99 per year in the US, which is roughly $8.25 a month for the prime service. This amount is nothing compared to the benefits you get from the service, which is almost everything at one place for your daily needs. If Amazon prices it equally cheap in India, it would translate to around Rs. 550 per month, which seems a decent price to pay for so many services, provided all are available at launch. If you are a regular Amazon customer, it makes a lot of sense for you to get this service as soon as it is launched and we’re hoping Amazon prices it competitively. Amazon Prime vs. Flipkart First? Flipkart First was launched nearly 2 years back and costs Rs. 500 was one year subscription in which you get free shipping with no minimum order value, same-day delivery and one-day delivery for select products and locations. Flipkart First also prioritizes subscribed customers over regular Flipkart customers and claims to offer 60-day replacement guarantee, as opposed to 30-day replacement policy for regular customers. However, Amazon Prime offers a lot more like online video streaming, music streaming and access to plenty of ebooks on Amazon’s portal. Amazon Prime has been tried and tested in developed countries and it will be interesting to see it battle out against Flipkart’s service in India. We’ll keep you posted as more information creeps out from Amazon’s headquarters and rumours convert to reality next month. "More Proof that Amazon Prime is Coming to India! ", 5 out of 5 based on 4 ratings. Reliance LYF Flame 3, Flame 4 VoLTE Smartphones Launched @ Rs 3,999!